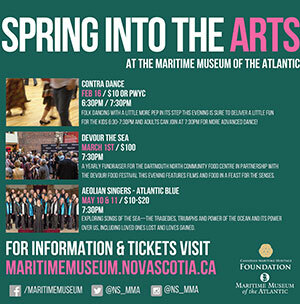 Since 2010, the Maritime Museum of the Atlantic has been reaching out to local arts groups interested in hosting special events in our Small Craft Gallery as part of our Fall and Spring Arts series (originally named Flagship Events). Being a rich and diverse local cultural community, we are excited to be a possible venue for music, dance, performance, visual or other cultural artists. In partnership, artists agree to have their event as part of our Fall into the Arts/Spring into the Arts series as co-presenter. It’s also requested there be a discount to our membership. Our third year with Devour! The Film and Food Fest for Dartmouth North Community Food Centre. Devour! The Sea is a special museum evening featuring local food and films; a feast for the senses in our historical setting! Exploring songs of the sea – the tragedies, triumphs and power of the ocean. A dramatic multimedia production on the theme of the journey. Passionate and virtuosic flamenco music and dance are framed by projections of Spanish art and textiles. A national collaborative project between 5 wind quintets, 5 composers and 5 cities. Oluseye is a Toronto-based visual artist from Lagos, Nigeria, who explores themes of identity, spirituality, value and existentialism. Presented as part of Nocturne: Art at night. An intimate exploration of the imagery and poetry of Water and the Sea through the multi vocal genres of Contemporary, Jazz, Music Theatre, Opera, Lieder and Art Song.